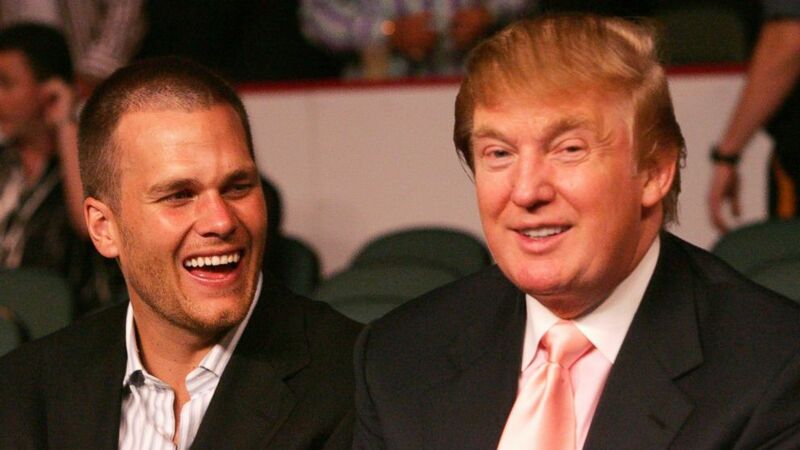 Tom Brady, left, and Donald Trump, right, are pictured on June 25, 2005. There’s one guy that Donald Trump isn’t bad mouthing -- Tom Brady. While the New England Patriots quarterback has been dealing with the deflategate scandal, he has had the support of the GOP presidential candidate from the beginning. And Trump seems to have Brady's admiration. A red “Make America Great Again” hat was spotted this weekend in Brady’s locker at Gillette Stadium. During today’s Dennis and Callahan Interview Morning Show on WEEI, Brady confirmed that the hat was indeed from Trump. According to Brady, the two first met back in 2002 and became great golfing buddies. The 38-year-old quarterback wouldn’t say if he’d vote for Trump in 2016, but complimented Trump’s accomplishments. As the NFL's investigation began into Brady’s alleged involvement with the deflated footballs in the AFC Championship game in January against the Indianapolis Colts, Trump advised Brady in a tweet to "Sue them Tom,"
Then when Brady’s four-game suspension by the NFL was overturned last week, Trump took to Twitter to congratulate his friend. Trump also confirmed he called Brady. “He's so thrilled and so happy. Tom Brady, I think what they have done is terrible. ... But I'm very happy for Tom,” Trump said to the press surrounding him at Trump Tower. Trump and Brady may have been even closer if Trump was the New England team's owner. According to NESN, Trump was offered the opportunity to buy the Patriots back in 1988, but decided against it because of the team’s debt of $100 million. But Trump is still rooting for the Pats although he’s from New York. Following the Patriots Super Bowl win, Trump tweeted that he loved that the Patriots won. Love that Patriots won - Brady is best ever! Seahawks pass was DUMBEST play in the history of football! Great going COACH B! The GOP frontrunner even re-tweeted supporters who were calling for a Trump-Brady ticket. But would the athlete leave football behind and seek a political career? “I don’t think I’ll ever get into politics. Maybe at one point I thought that might be something I want to do, but I think you take a step back and you realize the impact that you can have as a citizen,” Brady said.